Illuminate ignorance. Embrace suffering. Engage conflict. Wisely. Compassionately. Powerfully. It’s a reliable process for aligning who we are, how we feel, and what we do in any given context with the integral wisdom, compassion, and power that is always available to us, but not always self-evident in our day-to-day experience. ✓ Discover the 3 core dynamics & 3 universal dimensions of human experience that are the basis for integrity. ✓ Develop a more holistic understanding of yourself, others, and life conditions through multidimensional inquiry. By systematically training ourselves to pay attention to what’s happening in our lives from a perspective of wholeness, we begin to experience ourselves, each other, and the world more wholly/holy—completely and reverently. So we’re not denying the more troublesome aspects of our experience—this is not flight into light—but developing our capacity to be wiser, more compassionate, and more powerful in how we deal with these. Integrity Dynamics helps us face reality as it is just as we are while exploring the real possibility of creating something different, navigating the gaps between what is and what could be, who we are and who we aspire to be, how we are and how we want to be, what we do and what we need to do for a better experience of ourselves, each other, and the world. Register for an upcoming Course, explore one-to-one coaching, and/or bring this work to your particular organization or community. When we think of people lacking integrity, scam artists, shady salesmen, and corrupt politicians usually come to mind. However, we are all integrity challenged at times. Even when we are committed to living in integrity, none of us is able to embody integrity with everyone in every situation all of the time. Our lives are fraught with habitual patterns of fragmentation that significantly undermine our ability to live in integrity. Sometimes, it is challenging to figure out what is true, kind, or fair. Even if we know, we don't always have the capacity to enact it. We all have integrity gaps—particular moods, relationships, and situations—that compromise our integrity. Advocated for a decision (or candidate) using only the facts that support your point of view. Went along to get along against your better judgment. Taken on a project because you didn't feel comfortable voicing your objections. Failed to keep a secret. Called in sick when you were really playing hooky. Exaggerated about your experience, or expertise. Broken a promise to yourself or someone else. Remained silent when co-workers or friends gossiped about someone. Neglected to care about a group of people because they were born under a foreign flag, speak a different language, or voted for another candidate. Jumped to a faulty conclusion based on unchecked assumptions. Misjudged someone based on hearsay. Avoided someone's calls, or disregarded texts/email messages. Used products that are produced in unethical ways. Refused to apologize or admit a mistake. Said "yes" to a social engagement because you didn't want to hurt someone's feelings or you felt obligated. Taken more credit (or blame) than you deserve for something. Complained about others to a friend or colleague instead of speaking directly to those involved. Although we tend to think that people either have integrity or they don’t, the reality is that we all have it and we don’t. Integrity is not an end-state, but an ongoing process of responding holistically and dynamically to evolving circumstances. Integrity is a holistic, dynamic way of seeing and being. We move in and out of integrity depending on our ability to perceive and respond to the whole of what is happening in the moment. When we’re living in integrity, we’re able to be fluent and fluid in reality. We greet the full spectrum of human experience—the good, the bad, and the truly tragic—with greater clarity, equanimity, and courage. We are wiser, more compassionate, more powerful. We have a better understanding, which leads to better choices and better outcomes. Notice, that I said “better,” which is not necessarily easier, but always infinitely wiser, more compassionate, and more powerful. awareness of the essential wholeness within, between, and all around us. action in service of the greatest good for ourselves, each other, and the world. When we consider integrity, most of us tend to think about it in terms of being honest, or aligning our values or intentions with our actions—say what we mean, mean what we say, walk our talk. 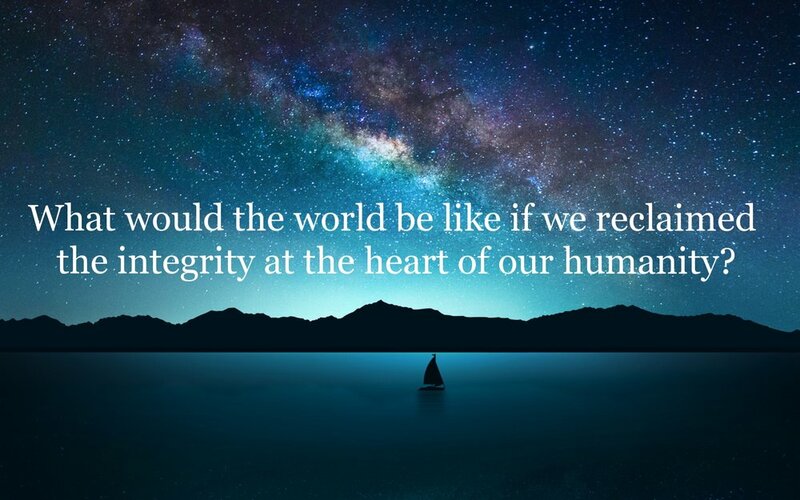 While this is part of integrity, integrity is really about being whole. Integrity is honoring the essential wholeness within, between, and all around us—the integrity of ourselves as individuals inhabiting unique bodyminds in relationship with each other given the conditions of our existence. It’s living with an awareness of our interdependence—that who I am, how I feel, and what I do relates to who you are, how you feel, and what you do, and that who we are, how we feel, and what we do together affects what’s happening in the state of our world—our relationships, institutions, communities, and planet as a whole. It’s a commitment to understanding what’s true not just from our own perspective, but from multiple points of view. It’s a commitment to being kind even to those we don’t particularly like or understand. It’s a commitment to doing what’s right or fair, even when it’s inconvenient and uncomfortable. Because it's not enough to know better. We also have to do better. Just being honest, nice, or right is not good enough in a world that needs us to be true, kind, and fair. With awareness comes the responsibility to act accordingly. Integrity is intentionally, consistently, and adaptively serving the greatest good as best we can as much as possible for ourselves, each other, and the world. Because the world needs us to become the best of who we are to address the worst of who we are. Learn about Integrity Dynamics: register for an upcoming Course, explore one-to-one coaching, and/or bring this work to your particular organization or community.